Everywhere we look in the month of February, there is chocolate. Delicious, soft, velvety, bittersweet chocolate. Melting chocolate. Solid chocolate. Soft chocolate cake with buttery chocolate frosting. It's like my very own version of heaven come to life. One must have other passions, n'est-ce pas? Bah, oui, bien sur! Cherries are high in Vitamin C & A and potassium and that's exactly what I concentrate on when I eat these bars. I also ponder the healthful oats and walnuts, the molasses (iron) in brown sugar and the whole grains in the flour. And then I add vanilla ice cream and really dig in. Hehe. 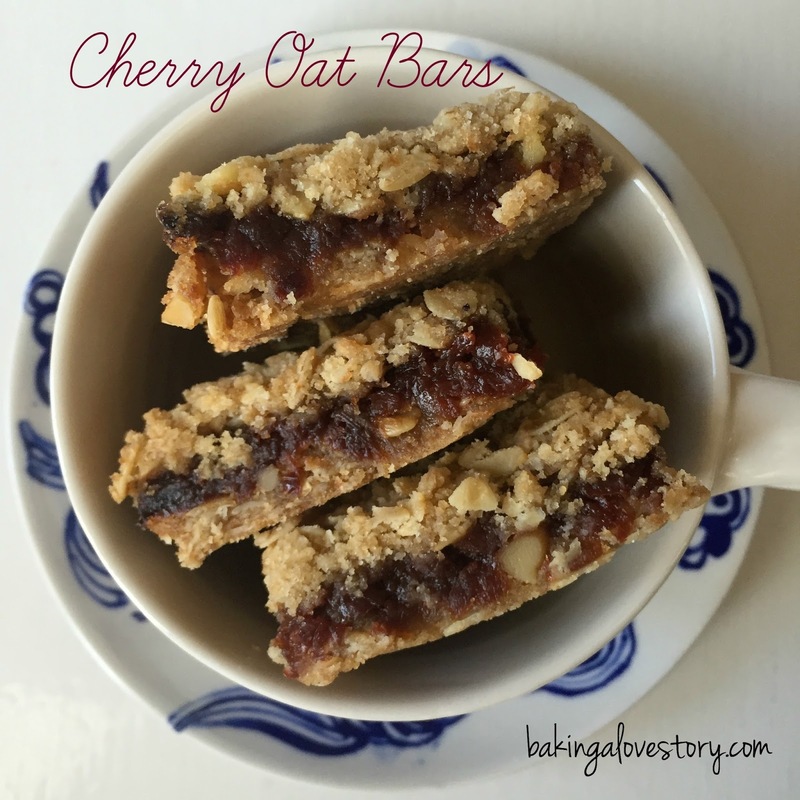 These are like brown-sugary-oaty granola/cookie bars with a gorgeous soft jammy center. They go as well in lunch boxes as they do at tea time. They ship pretty well, too! You can even substitute 1-1/2 cups of your favorite jam if you don't want to go to the trouble of making the cherry jam, although I cannot promise mouth-watering results. Wink, wink. A nice alternative to chocolate, cherries also happen to be red, like the boxes of Valentine chocolates we see everywhere. And baking something in your own kitchen says love way better than a card. Dontcha think? 1. Place the cherries into a bowl and pour the boiling water over top. Let sit about 30 minutes and drain. 2. In a heavy sauce pan, heat the reconstituted cherries, sugar and additional 1/2 C water over medium low heat. Boil about 15 minutes or until the jam thickens into a pasty texture. You may need to add more water, one tablespoon at a time, until it reaches a thick but spreadable texture. Set aside. Note: If you use jarred jam, it will spread more easily when heated up, so, either warm it on the stove top or microwave it for about 45 seconds before adding it to the cookie base. 3. Preheat your oven to 350. 4. Combine all the dry ingredients in a large mixing bowl. 5. Cut the butter into the mixture until the dough resembles a coarse meal. I often use my hands and squeeze the butter into the dry ingredients. Once it gets sticky, I stop mixing. 6. Divide the dough into half and press one half into the bottom of an 8"x8" baking pan. 7. Spread the jam over the pressed dough. 8. Pour the remaining crumbly dough on top of the jam. You can even the top a bit, but no need to make it perfect. 9. Bake at 350 for 25-30 minutes or until the top is lightly browned. 10. Cool completely and cut into 9 good-sized bars, or 16 smaller bars. Why thank you so much for your comment, Miss Melissa! There will be all sorts of Valentine-y chocolate on the blog next week, too, but I like a little variety. So glad you do too!